8a Brown - search reveals hidden west - stepping to west will carry you to brown square connected by line. This is in between walls, and is suppose to go around level 2. W - "get key wagon"
K - Komarin - 20k gold, Loads 6d7 enchantable sword and key, other key may still be in room and you will need to get it. 7 - Hidden room, no need to search, just walk into it. "Get Head"
Room west of brown square, leads down into incinerator, bottom room connects to 5 rooms below this map, which starts back up other side. 11 - The Library , room north of here takes you to room at end of line on map. S - can get gold bar while you are here, Lurkers cant be hit with weapons, spells only, real pain, can sneak past them. D - Durness (18K gold)- kill snowhawks first, one loads a talon, low level dagger -(5d5 +1dam)(lvl 14), There is a room either to the east or left of here. Kill Durness, get key, go west, open chest, get ladder. (Use Storage key obtained from ice box earlier for room north of entrance to lower level, which has more coats if you are in a party of people and need more than the one. L - I cleaned out mobs before Lo's room and then shielded. Cant use spells when fighting him, so I had to flee , heal up, and bs him a number of times to kill ( was running out of time, didnt wright down equipment) get key, may be some other stuff here, didnt look around and cant remember. some more treasure here i remember, but did not have time to check out. 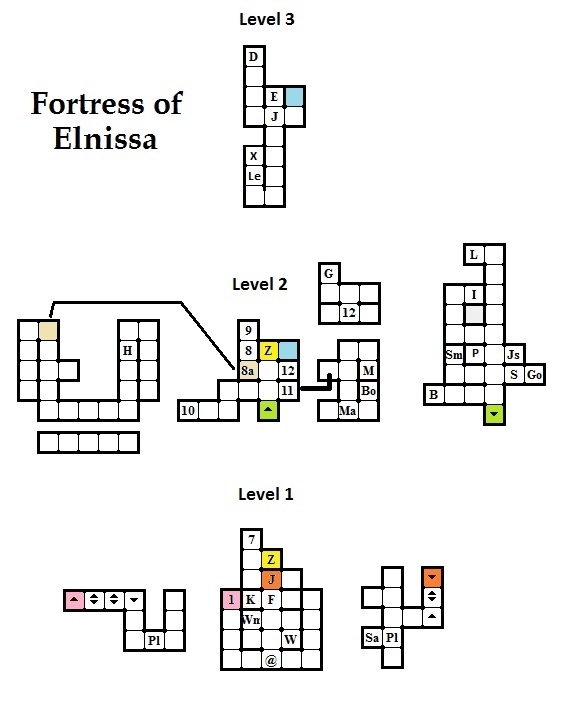 of J (level 3) but did not have time to map it either, the rooms i put for that area is just a guess, but it is only a few rooms so you get the idea.